Is the Cummins 12 Valve 5.9L the Best Diesel Ever Built? Weighing in at 1,100 pounds this heavyweight was brought to market under the hood of the Dodge Ram in 1989. It was originally designed to power agricultural vehicles 8 years earlier and in fact was the brainchild of a Case/Cummins joint venture. 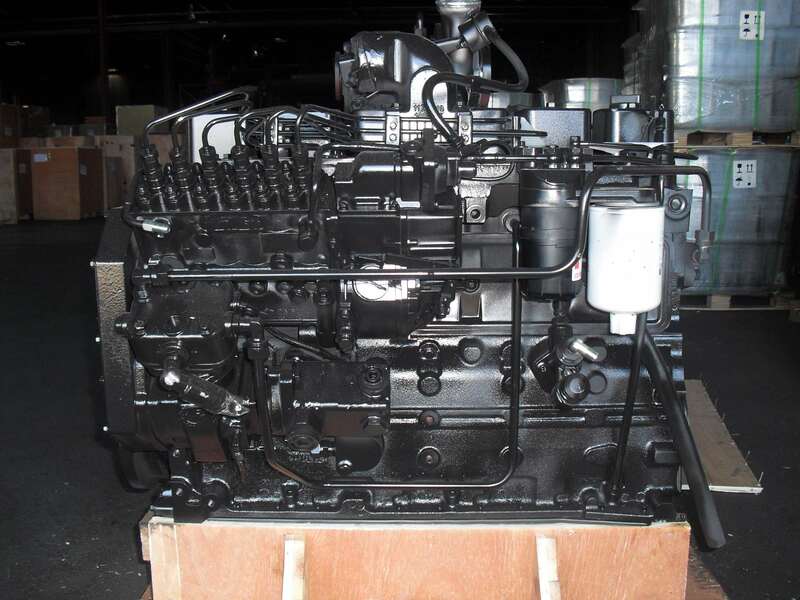 The engine marketed as the 6B, 6BT, and 6BTAA was wildly popular in agriculture equipment, road graders, sprayers, wood chippers, boats and light duty shuttle busses. Around the same time the new 6BT was starting to gain popularity worldwide it was announced that Chrysler was planning on a new flagship heavy duty diesel truck to compete with Ford and GM. 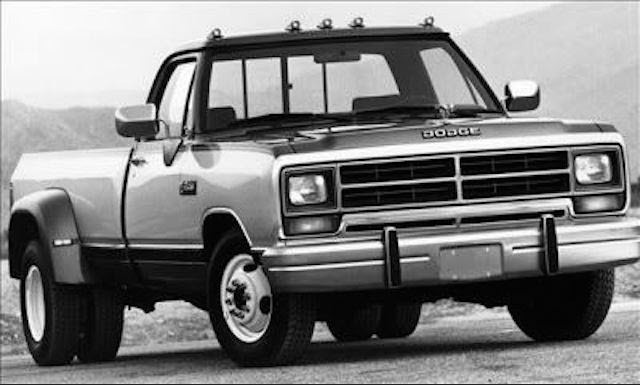 The Dodge Ram was first introduced in 1981 and was severely lagging behind the other automakers in Detroit. 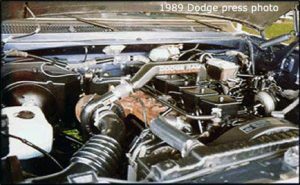 The original gas engine in the ram was a Slant I6 engine first introduced in 1959. At the time Chrysler faced stiff competition from General Motors and Ford and as the years passed the company realized that they need that ingredient X to make them a leader in the class. 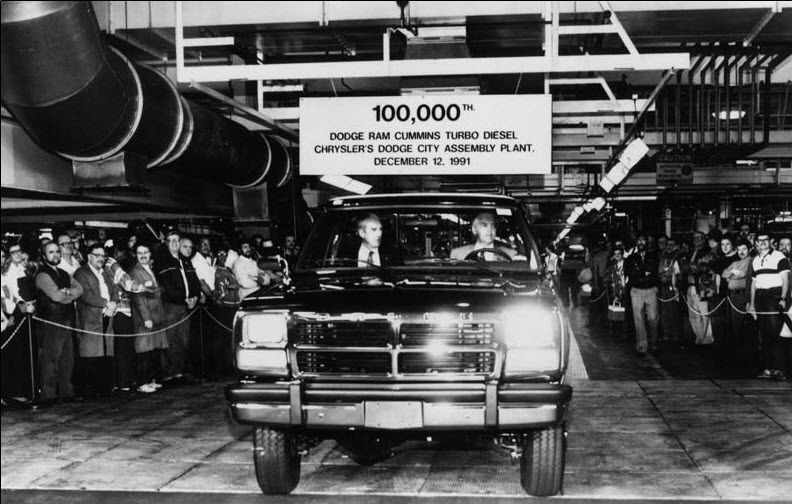 They looked to the industrial Cummins 6BT wondering whether that could be the answer, and after some masterful engineering, designed the Ram to accommodate the engine. It turned out to be a marriage made in heaven and Chrysler were now the in the Heavy Duty Pick Up market. So, what makes the (5.9L) 6BT so special? It’s incredible reliability for a start, matched by its massive performance potential and ability to power across the most rugged of terrains. The engine originally put out 160 HP but it was its unsurpassed 400 ft-lb of torque that put the 5.9 L in a category all its own. It was because of this that when word got around it became a popular swap for Jeeps, dragsters and modified old pickup trucks. What makes the 5.9 L (6BT) still sought after nearly 30 years after its original design is its simplicity. It's a "dumb engine" and that's a very good thing in the diesel world. The blocks are all cast iron but the crankshaft and connecting rods are all forged in steel. Many manufactures switched from forged steel blocks to the cheaper cast iron in the 1970s however Cummins decided to further in-rich the castings with added alloys to give the blocks additional strength. The engineers originally designed the 5.9 L to handle all kinds of off-road and industrial environments, that being said the crankshaft has 7 oversized crankshaft bearings. The larger surface area more properly lubricates the engine and safeguards against friction and wear. Cummins also did away with belts completely, which are prone to cracking and maintenance issues and utilized a timed gear-train instead. 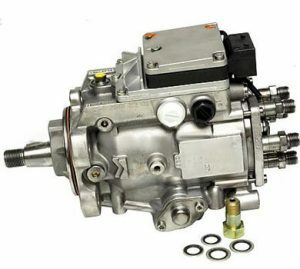 The engine was improved even further when Cummins swapped the mechanical Bosch VE rotary injection pump to the Bosch 7100, an inline mechanical injection pump. This injection pump, often called a "P-pump," is the Holley Four-barrel carburettor of the diesel world. Though the P7100 pump has been around forever, it is practically bulletproof and incredibly tuneable for high performance. The P-7100 uses a lift pump to supply fuel to the unit which pressurizes it and delivers it perfectly based upon a mechanical camshaft timing design. The design allows for all kinds of modifications to the governor springs and fuel plates to increase fuel flow and horsepower. The pump was also made for roughly 2% of the Cummins 4BT (3.9 L) models as well. The 6BT offers 400 lb per foot of pure grunt, a good 50lb more than you got with Ford’s 7.3 liter engine. There was also the mind-boggling durability which brought the nickname ‘the 1,000,000-mile engine’, indeed, over ten thousand members of the Cummins High Mileage Club have clocked over that figure. Not to be underestimated is the simple design along with interchangeable parts and stripped bare of electrical components that were beginning to clutter up other models. Just a couple of wires was all that was needed to get the beast started. The simplicity of the design enabled the adding of even more power by installing bigger turbos, injectors, lift pumps and intercoolers. With the engine being built to handle so much power these modifications are easily accommodated. Then came the use, from 1994 onwards, of the Holset HX35 turbo charger. The Holset HX35 is designed primarily for 6-cylinder engines of 5.0 to 6.5 liter capacity, and has high flow aerodynamics capable of providing up to 0.46 kg/s at 3.0:1 pressure ration. Other features that come as standard include; choice of turbine housing materials to cover wide range of temperatures, compressor and turbine wheels selected for optimum airflow, efficiency and pressure ratio, fully adjustable compressor and turbine housing orientation, fully floating twin hydrodynamic journal bearings, high efficiency compressors with broad operating ranges, high pressure ratio capability, super back compressor wheel for extended life and durability at high turbo speeds, symmetrical twin flow turbine housings and a variety of compressor and turbine housing flanges. The HX35 is designed to deliver 20 psi the to the 6BT but can accommodate double that and by disabling the wastegate functionality. Despite Cummins’ competitors changing their engines many times since the late 80s, Cummins remained true to the original, instead simply adding or replacing features. In the late nineties the 12-valve version morphed into a 24 valve whilst the P Pump was upgraded to a Bosch VP44 electronic fuel injection. This was a stop-gap between switching to a common rail system and to comply with new environmental regulations, but as stop-gaps go, was very effective. Cummins designed an Electronic Control Module (ECM) to which they could download different engine control programs without making any physical changes to the engine. The ECU is installed in a sealed box that is mounted directly to the cylinder block of the engine. The ECM directly communicates with the VE fuel pump through a dual port high speed communication and data connection and can dial up or down the power based upon road and driver conditions. There is no direct connection from the throttle to the injector pump. Inputs from engine sensors and the throttle position are used by the ECM to determine how much fuel is injected, and when. The ECM uses sensor and throttle position inputs to compute the appropriate "load", then the controller obtains the fueling rate information from look-up tables, sometimes called maps, stored in ROM. From these a value is determined that represents the desired amount of fuel to be delivered to the engine. This value is then communicated to the injector pump. 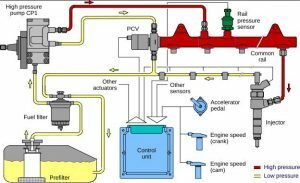 The VP44 injection pump uses a set of mechanical plungers to pressurize the fuel, and a mechanical distributor to route the fuel to the correct injector. Rotary pump designs using wavy disks regulate fuel back-pressure better than inline mechanical pumps thus allowing better fuel economy. An electronic controller converts the fuel information sent from the ECU into mechanical control of the fuel delivery by opening and closing fuel spill ports inside the pump mechanism. The pump returns information to the ECM regarding its current operating state. Pretty neat, huh? In 2003 they introduced the common rail system. The common rail is a fuel injection system found in modern diesel engines and provide a level of flexibility which can be exploited for class leading emission control, power and fuel consumption. This enables OEMs to design for optimal performance and exceptional end-user value across a range of machines and applications. The fuel is electronically measured, compressed and delivered to the engine pressurized which provides better fuel economy than traditional mechanical style fuel systems. It wasn’t until 2007 when they made a major change, and this was to replace the 5.9 liter with a larger bored and stroked version giving 6.7 liters of displacement. This was necessary to further reduce emissions and the increased displacement was essential to maintain performance - but also caused much discernment amongst the stalwart Cummins advocates as the engine had to become more complex to accommodate the needed hardware to achieve the reduced emissions. However, the 6.7 liter soon found many plaudits throughout the world and Cummins powered trucks remain the King of the roads, but undoubtedly, in this author’s opinion, the (5.9 L) 6BT is the Mother of all Engines. Rumor Mill: Did Ford Own Cummins?